The market for pre-workout supplements has been saturated with products that contain stimulants and caffeine. While such ingredients may provide us with the boost during a workout, not all people wants or needs this artificial boost. There are many high quality stimulant-free pre-workout supplement options available for you. With all the different options out there, it is important that you choose your supplement carefully and wisely. Why Should You Opt for Best Stim-free Pre-Workout? The main purpose of adding stimulants like caffeine in a pre-workout supplement is to give you an energy boost. The typical dose of caffeine included in most pre-workout supplements is often equivalent to one or two cups of coffee. So, why should you opt for stimulant-free pre-workout supplements? One of the reasons why stimulant containing supplements should be avoided is that stimulants like coffee are not safe for those people who have high blood pressure. In fact, stimulants function through vasoconstriction. This means that it can tighten the blood vessels, resulting in an increase in blood pressure due to the difficulty in pumping blood throughout the body. For those people who already have high blood pressure, taking stimulant-containing supplements can be dangerous. Also, if you have a pre-existing health condition or that you are currently taking prescription medications, it is best to consult your health care provider if you are thinking of taking any supplement as the ingredients of the supplement may interfere with your medications or can worsen your current health condition. Another reason why you should avoid stimulant-containing supplements is that stimulants like caffeine can interfere with your sleep. If you take supplements with caffeine late in the afternoon when you work out, you may not be able to sleep well at night. After taking stimulants like caffeine, your central nervous system can remain alerted for an average of five hours. Stimulants can have adverse effects like anxiety, nausea, vomiting, and stomach pain. Some who take supplements with stimulants can experience these side effects. In such cases, the benefit of stimulants does not outweigh the side effects. Most stimulants including caffeine promote not only physical boost but also mental boost. Stimulant increases the dopamine levels in the brain, which is a neurotransmitter that is closely associated with feelings of pleasure. You will probably feel a little high while you are on stimulants. However, the crash after the effects wear off will often leave you craving for more. In fact, some people who have become addicted to stimulants often experience depression and anxiety as they come off and stop taking it. What Ingredients Should You Look for Instead? There are other ingredients that can substitute for stimulants in pre-workout supplements. Stimulant-free supplements do work well in providing you with the boost as well as the energy that you need for your workouts. The most common substitute for stimulants in pre-workout supplements is amino acids. There are different kinds of amino acids and each of them offers a wide array of benefits. The right amino acid will not only improve endurance but also give you more power in fast tracking muscle repair and recovery in every workout session. Here is a list of the most common amino acids that can substitute stimulants in pre-workout supplements. Naturally, creatine is produced through combining two distinct amino acids, namely arginine and glycine. This nitrous acid is one of the well-researched ingredients of workout supplement in the market. In fact, creatine is known to stimulate muscle growth and increase strength during workouts. According to studies, taking creatine supplements can greatly improve athletic performance. In addition, it has numerous long-term benefits including less fat mass, more muscle mass and greater strength. This supplement ingredient is also referred to as L-citrulline. This is an amino acid that helps the body produce more nitric oxide, which is a vasodilator that helps the body improve blood circulation. With this amino acid, the blood vessels widen, allowing greater blood flow to the exercising muscles. With improved blood flow, more oxygen and nutrients are delivered to the muscle, resulting in an improved performance. This supplement is often combined with L-malate and often noted as citrulline malate. Malate is malic acid and this amino acid helps boost your energy levels. Citrulline malate does not only improve performance but also reduces muscle soreness, which is perfect for those who are new to working out. Beta-alanine is an amino acid that is naturally produced in the liver. Despite being referred to as a non-essential amino acid as it is not necessary for people to consume it, this amino acid provides additional benefits. 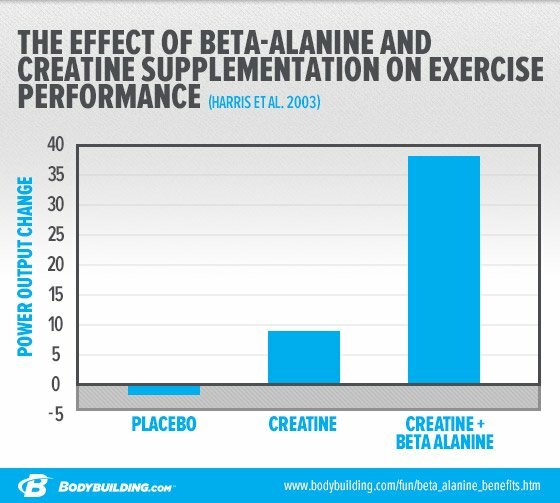 When you consume beta-alanine, this amino acid goes to the muscle fibers. It binds with histidine to form carnosine, which is responsible for maintaining the normal blood pH. This amino acid acts as a buffer between the hydrogen ions in the body to promote less acid build up. Maintaining the right pH level especially in your blood is essential, as too much acid can result in muscle fatigue. During workouts, the body naturally produces more acid, resulting in feelings of being worn out. Beta-alanine can help reduce such effects. BCAAs or branched chain amino acids are also essential ingredients in supplements, as they are known as workout boosters. The primary BCAAs include L-valine, L-isoleucine, and L-leucine. Leucine is considered the most beneficial BCAA. For such reason, many pre-workout supplements are equipped with this amino acid. The effects of BCAAs include greater muscle strength, improved fat loss, and more lean muscle gains. This pre-workout supplement is definitely a great buy! It comes with premium quality ingredients. In fact, this supplement is incorporated with BCAAs which helps muscles recover faster and preserves the muscles during exercises. Also, this supplement is formulated to promote increasing energy production and improves overall body composition. This supplement is not only beneficial before and during workouts as this is formulated to significantly reduce post-workout soreness. The BCAAs incorporated in this supplement are plant based, which makes it easier for the body to absorb and use. In every serving, you will get a generous amount of 8 grams of naturally fermented BCAAs. Not just that, the AAN BCAA powder also comes with beta-alanine which promotes strength, muscle growth, greater cardio endurance, and fatigue reduction. This pre-workout supplement is formulated to help build muscle mass and significantly increase strength. In fact, this is packed with high-quality ingredients for guaranteed potency and positive outcome. This supplement comes with 5 grams of creatine monohydrate, 3 grams of organic betaine, 3 grams of fermented leucine, and 50 mg of astragin. This supplement does not contain any fillers, dyes or chemicals. Also, this does not contain any stimulant like caffeine. This stimulant-free supplement has been proven and tested to promote performance during workouts and lean mass gains. Not just that, this supplement helps increase levels of intracellular carnosine which delays fatigue and reduce metabolic acidosis during workouts. With this supplement, you will surely see increases in your performance and lean muscle growth. This supplement is definitely a great supplement that will help you improve your performance. This supplement has been formulated to promote muscle growth through boosting L-arginine production, resulting in greater blood flow throughout the body. Your exercising muscles will be able to get all the essential nutrients and ample amounts of oxygen it needs during a workout. This pre-workout supplement does not contain caffeine or any other stimulant. Also, it is not formulated with artificial flavors and colors. This is hypoallergenic and vegetarian. This supplement is the first clinically dosed nootropic-based pre-workout supplement. This does not contain caffeine or any stimulants. With its unique blend of key ingredients including L-arginine, L-citrulline, and EleATP, you can definitely feel the natural boost while improving performance and promoting strength during your workout sessions. This supplement has been naturally sweetened without the fillers, junks, and dyes. It is essential to choose the right pre-workout supplement for your needs, as there are many different options available in the market. If you want a natural boost then stimulant-free pre-workout supplements are the best supplements for you. It offers the same effects and results but without the potential side effects of stimulants like caffeine. When it comes to stimulant-free options, the RAW PREMASS - 2-In-1 Pre-Workout Mass Gainer has made the cut. This supplement is not only effective but also contains safe and natural plant-based ingredients. For improved performance, strength and muscle growth, this supplement is definitely worth your money!